Adam reviews the jaw dropping restoration of Frank Henenlotter’s cult classic Basket Case released by Arrow Video in a mountainous Blu-Ray release. Basket Case was a blind spot for me until this release. Frank Henenlotter’s debut feature film is a deranged mixture of Bad Seed and Monster cinema. The film shows New York City the same way that Taxi Driver, Q: The Winged Serpent and Maniac do. That artfully grimy filth that permeates throughout each of those films is ever present here along with the sort of sledgehammer thematics that all save one (Taxi Driver), deal in. Henenlotter with Basket Case seems driven to be the weirder Larry Cohen. The film is essentially a revenge picture with Duane and Belial Bradley in search of the Doctors that separated them. One small detail that separates this form say Rolling Thunder. Belial is the not-fully-developed no-longer-conjoined twin of the full formed Duane. This task takes the twins from the deepest woods of upstate New York to the grit and slime of New York City of the early 1980’s. What the film lacks in subtly, it more than makes up for in brash excess and surprisingly effective set pieces. Where many would wink-and-nod to the audience, making sure everyone knew it was okay to laugh; Basket Case does nothing of the sort. Henenlotter makes sure that any sort of comedy, both intentional and unintentional, is sucker punched away by the attacks on not only the doctors but innocents. 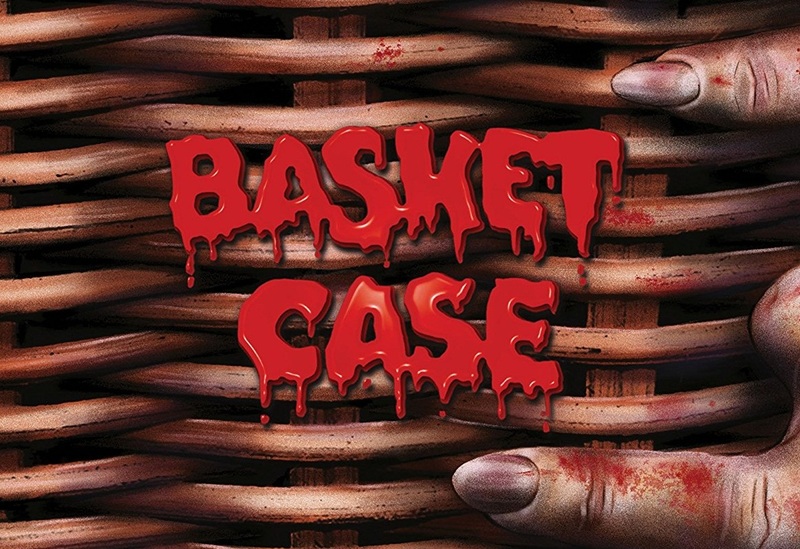 Basket Case is designed to be a nasty bit of business. It succeeds in a way some of its contemporaries (or the films it also lovingly homages) could never or would never attempt. The success of the film falls largely on Kevin Van Hentenryck’s performance. Van Hentenryck’s work is on par with Mark Hamill’s in The Empire Strikes Back. Both performers spend most of their respective films runtime performing against a puppet. What would have stopped anyone else’s performance dead in its tracks seems to unencumbered Van Hentenryck to create this wonderfully deranged performance. Duane is a shattered human being, abused by everyone including Belial his own brother. Van Hentenryck commits to that shell of a human portrayal. Duane’s finding some small piece of humanity and how that’s stripped from him is what gives the film and the performance such power. Basket Case more than thirty-five years later still has the power to push and pull an audience. Though it’s steeped in the grindhouse cinema it’s lovingly homaging, there is something more to this film. The blunt force trauma of where Henenlotter takes the film is more artful than those films. That wherein lies the power of Basket Case and its sledgehammer artfulness. Where those films strive for titillation for the sake of titillation, Basket Case strives for emotion and human tragedy. The results are stark, brilliant and unforgettable. The new 4K restoration from the original 16mm negative by MoMA is literally jaw-dropping. This restoration is on par with their brilliant work on Night of the Living Dead transfer that Criterion just released. MoMA has taken the time, care and attention to detail to make this transfer look better than Basket Case has ever looked. Though I’ve never seen the film I have seen enough clips and referenced the last DVD edition and the comparisons are night and day. Short of a UHD version of this film, this will stand as the definitive presentation. Arrow has done it again. They’ve found a way to exceed even the biggest fans with their thoughtfully curated extras. The extras impressive to say the least, with approximately 8 hours of bonus materials this is the definitive edition of the film. The audio commentary with writer/director Frank Henenlotter and star Kevin Van Hentenryck is a great lively commentary track with both men casually discussing the making of and the history of Basket Case and its sequels. They do happen to cover some of the same information in various other features but the commentary has a lot not talked about and well worth a listen. Basket Case 3-1/2: An Interview with Duane Bradley is an 8-minute short film by Henenlotter. This clever little “found footage” style short catches up with Duane, Belial and Belial’s progeny. Let’s just say it’s interesting where they are now. I and the Bradley Boys is a 16-minute interview with Kevin Van Hentenryck. The interview, conducted by Henenlotter, charts Van Hentenryck’s history with Henenlotter, how he got the part and the production. It’s a fascinating interview and only confirms how much time and care Hentenryck took with is performance. A Brief Interview with Director Frank Henenlotter is a hilarious 8-minute parody of interviews where a man who isn’t Frank Henenlotter sits naked (yes, very-very NSFW naked) answering questions. Seeing Double: The Basket Case Twins is a 9-minute interview with the twin Nurses of Basket Case; Florence and Maryellen Schultz. The twins who also happen to be Henenlotter’s cousins discuss their childhood with their cousin and the production itself. The Making of Basket Case: The Latvian Connection is a 28-minute making-of featurette with producer Edgar Ievins, casting person/actress Ilze Balodis, associate producer/effects artist Ugis Nigals and Belial performer Kika Nigals. Rather than be a normal making-of the conceit of the doc is telling the story of Basket Case through the friends of Frank Henenlotter’s who would eventually become the crew (and sometimes cast) of the film. There are some great stories and recollections in this featurette, like the daughter of Balodis and Nigals, Kika was the primary puppeteer. Keep in mind their daughter Kika was only nine-years-old at the time! Blood, BASKET and Beyond is a 6-minute interview with Beverly Bonner. Bonner discusses her history post-Basket Case with the series and her side-sequel project that evolved out of her off-off-off Broadway experience and history. Belial Goes to the Drive-In is a 7-minute interview with the great Joe Bob Briggs shot in and around the late great Waverly Cinema in New York City. Briggs brings his artful dissection of the film and also his very interesting history with this film which began at the Cannes Film Festival. What’s in the Basket is another making-of but this one is a 68-minute documentary created by Severin Films (for their initial release) that covers the entire trilogy. As someone that has not seen either sequel I only watched the first fifteen minutes of this documentary. I can attest to the quality and detail they go into. Basket Case Outtakes is a random smatter of B-Roll, Take Markers, Alternate Takes and deleted scenes edited together in a very entertaining 6-minute featurette. In Search of the Hotel Broslin is a 16-minute featurette with Henenlotter who’s accompanied by a man named R.A. “The Rugged Man” Thorburn as they wander New York looking for the various locations that compose of the Hotel Broslin. This featurette from 2001 may be the ultimate New Yorker’s New Yorker interview I’ve ever seen. Frisson of Frission is a 23-minute video essay by Critic Travis Crawford. The essay is a great piece of critical and visual work. Crawford does a great job of dissecting Basket Case and putting it in context of Cult Cinema as a whole. Slash of the Knife is an early short film by Henenlotter that is actually referenced quite a few times on the special features. Arrow goes one up by giving the short its own Commentary and a Still Galleries. Trailers, TV Spots, Radio Spots, Extensive Still Galleries round out this overstuffed edition. Arrow has gone above and beyond with Basket Case. The transfer and the special features make this a Top Blu-Ray release contender even this early in 2018. Highest possible recommendations!!! Arrow Video’s Blu-Ray Release of Basket Case is out now.